A calm has settled over the past couple of days, and it is summer as it should be: sunny and hot. In the dim light of dawn ribbons of fog unfurl in the fields, the fields now brushed with brown as clover heads crumble and timothy and brome, tall enough to tickle my elbow, dry to amber, go to seed. Early goldenrod blooms while later forms grow ever greener and lankier. Some chokecherries have drooping clusters of blood-red berries, others have leaves yellowed and spotted blackish brown. In the foggy morning stillness, large patches of Queen Anne’s lace look like drifts of snow and apparently summer, too, can play fast and loose with the attributes of other seasons. The only real signs of change are far-flung splashes of red, mounds of small green and blushing apples on the apple trees, antlers on the buck, and an almost imperceptible change in the rustle of the leaves. The smell is a rich mix of growth and decay, mushrooms and black-eyed Susans. 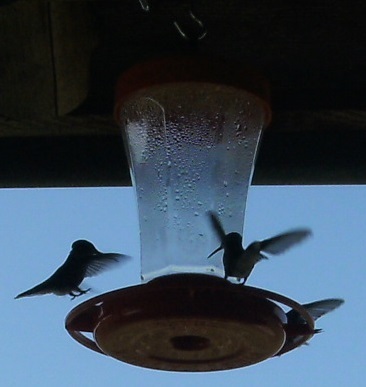 And then there was that passel of hummingbirds. I have never seen more than three or four hummingbirds at the feeder that hangs from the edge of the porch just under the roof in front of the kitchen window, but one morning early this week, as I was at my table working on candles, the hummie ruckus became so loud I had to look up, had to start counting eight, ten, twelve hummers all zipping, zooming, hovering, fighting, squawking, chirping, peeping; they were attacking one another, chasing one another, settling in a huff on the clothesline next to the feeder then starting it all over again, speeding this way and that, disappearing north and south and out west into the fields before banking a u-turn, zeroing in on the feeder and each other once again. Suddenly, there would be none. Suddenly, there would be one, two, three, a dozen. In all the fuss, nobody seemed to be getting at what they were fighting over: the large feeder filled with sugar water encircled by a perch and ten sippy holes. Looks like an orderly landing. But will it last? I found a second feeder in the garage, filled it, hung it from the low northwest corner of the garage roof. 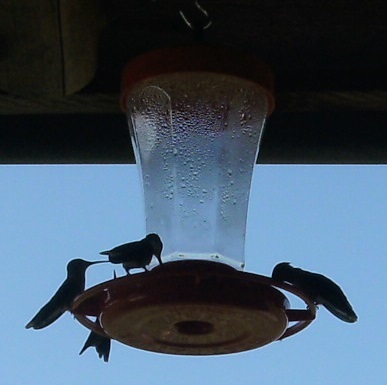 It attracted little attention—it has no perch, only three holes—but it did seem to relieve some of the tension surrounding the other feeder. Soon after it went up, hummers started settling on the perch and drinking. It was an uneasy settling. In one second, six or eight would be sipping, their long beaks inserted in the feeder’s tiny holes, throats throbbing with each gulp, and in the next second they would all lift up, hover, move one sippy hole over, settle again, drink. One more second, lift up, hover, shift, settle, drink, et cetera, until fights and flights resumed. Soon, at my own peril, I had to refill the feeder. The porch had turned into a Danger: Hummie Crossing zone, or maybe just Danger: Hummies: Cross. And here they seem to be feeding so peaceably. The fuss continued all day and well into the evening. A couple weeks ago the editor of the local newspaper had written about a similar situation at his hummingbird feeders, but I don’t recall him giving a reason for it. Perhaps there are just wild bands of hummers that go around invading other hummer territories like a rogue motorcycle gang. With a swagger of lawlessness they varoom up to a small town feeder-slash-diner, bust through the door like they own the joint, make fun of the prim waitress, mock the yokels, guffaw loudly, and generally make it unpleasant for everyone. Or maybe all the new-born hummies were just now old enough to join mom and pop at the dinner table and Hello, but who suggested we have all these kids? Hey! Where are your feeder manners, junior? Now what did I tell you about that? Or maybe it had to do with migration. Earlier in the week our nights were in the thirties, days in the fifties and low sixties, summer playing dangerously with autumn, and maybe some hummers had fallen for it and were taking off south and Say! Henry! Let’s stop here at the Pea Pickle Inn! And, or, maybe, this generally cool, damp, summer had left certain flowers the hummies might otherwise be sipping on without nectar so hence a mad feeder rush. So, a pugnacious passel of hummingbirds. Meanwhile, Sadie and her gang have been visiting. One morning I saw Mortimer and Sneed, followed closely by Sadie and the buck, crossing the north field. In the evenings, Sadie has been browsing in the yard along the west edge where the sometimes-mowed-grass meets the wild field, and one day she had Mortimer and Sneed with her and another time the fawns. She also shows up on her own. The interest in Elliott seems to have waned a bit. I noticed that the scar on her left side, just beyond the shoulder, is duplicated on the right, both scars running horizontally maybe six inches or so. Looking at her through the binoculars, her face seems slightly grey. She has sparse, long whiskers coming from her chin, and sometimes one ear flops back while the other stays forward. One night I was watching Sadie from the upper deck as she grazed the north field. I was holding the binoculars up to my eyeglasses. Suddenly there was a loud thrumming in my ears. I froze. On my hands I felt the light brush of wings, beating rapidly. They moved off, I slowly lowered the binoculars. I stared at the hummingbird hovering in mid-air about one foot from my face and wondered what the heck it was all about. I uploaded one of the videos I took and then found this video of hummies flocking around a water fountain - http://www.youtube.com/watch?v=tLP-X8oXqVM. To be a hummingbird would be exhausting!